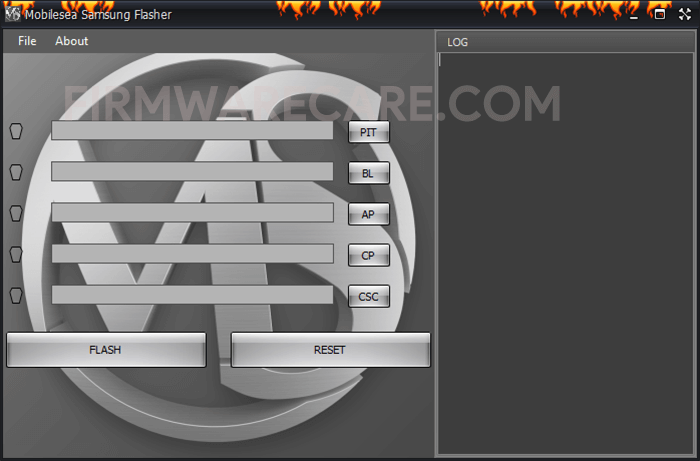 Mobilesea Samsung Flasher is a small application for windows computer created by Mobilesea Team, which allows you to flash the stock firmware on Samsung Smartphone and Tablets in few clicks only. It allows you to flash the stock firmware (flash file) on your Samsung Smartphone and Tablets. It works same as the Odin Downloader Tool which also allows you to flash the stock firmware on your Samsung devices. It allows you to Flash the Samsung PIT Files, BL files, AP Files, CP Files, CSC Files. it also supports flashing of Samsung 4 Files and Samsung Md5 firmware on the Samsung devices. In order to use the Mobilesea Samsung Flash Tool, you need to install the Universal ADB Driver or Samsung USB Driver on your computer. After installing the USb Driver, you need to Boot your Samsung device into the download mode (Volume Down + Home + Power Key). Once your device is booted into the download Mode, connect it to the computer with the USB Cable. Once the device is connected, launch the Samsung Flasher Tool and Load the firmware into the tool to begin the flashing. [*] Compatibility: The Mobilesea Samsung Flash Application runs perfectly on Windows XP, Windows Vista, Windows 7, Windows 8, Windows 8.1 and Windows 10 (32 bit and 64 bit). [*] Credits: Mobilesea Samsung Flasher is created and distributed by Mobilesea Team (developer). So, full credits goes to Mobilesea Team (developer) for sharing the tool for free.